Bantam, 2011. Paperback. New. 8.2 x 5.5 cm. NEW YORK: DELACORTE, 2007. 1ST EDITION 1ST PRINTING. HARDCOVER. NEAR FINE/NEAR FINE. NEW YORK: DELACORTE, 2007. 1ST EDITION 1ST PRINTING. NEAR FINE/NEAR FINE. SIGNED. New York: Delacorte, (2007.) dj, 2007. SIGNED hardcover first edition - First US printing. 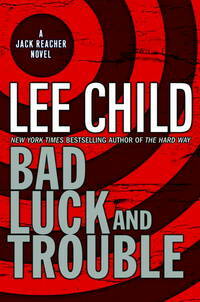 Ten years after he left the military police, Reacher is still a loner, with no possessions other than his folding toothbrush - but when the body of one member of the Special Investigative unit he headed in the military is found in the desert, dropped from a helicopter, he gets back together with the surviving members of that crack unit - to prove once again the truth of their motto - 'You do not mess with the Special Investigators.' Lots of fast action - this will make a great movie! Winner of the Lovey Award for best thriller SIGNED on title page. 377 pp. Near fine book in Near Fine DJ. No remainder mark. unclipped. Archival cover. Picture of author at signing laid in.